In January 2007's PC Notes, I discussed various ways of coping with the lack of Direct X plug-in compatibility in Steinberg's Cubase 4 DAW software. Unfortunately, as I recently discovered, there are several other flies in the Cubase 4 plug-in ointment, so this month I'm offering more advice and a few workarounds for PC users. First and foremost, VST3 instruments and plug-ins now save their presets using a completely different format (vstpreset) from the simpler FXP and FXB files previously used to save single presets and banks. This format is tied in with the new Soundframe 'Universal Sound Manager', which incorporates the Mediabay file-management system. This lets you search instrument and plug-in presets for sounds tagged by characteristics such as Acoustic, Percussive, Clean, Dirty, and so on. This is very clever stuff and will no doubt be appreciated by composers with thousands of sounds to choose from, and those with loads of drum loops that can now be characterised by song tempo. However, opinions are still divided about the merits of Mediabay, primarily because its effectiveness depends on your presets being sensibly 'tagged'. All the new bundled Cubase 4 instruments and plug-ins are, of course, suitably characterised for Mediabay searches but few, if any, third-party ones are so far, and somehow I suspect this situation won't change. After all, third-party developers are far more interested in you specifically launching their instrument or plug-in for its unique sounds, rather than because one of its presets happens to pop up as part of a list when you search for a 'dark string' sound! However, there's another limitation that many users are only discovering the hard way: while Cubase 4 will happily import presets in FXP/FXB format, so you can still access all your old sounds, it will only save them in the new VST3 format. This isn't a problem if you only ever use Cubase 4, but many PC users use other VST-compatible applications, such as Acid, Acoustica, Audacity, Cubase SX/VST, Gigastudio, Sonar, Tracktion... the list goes on. If you find yourself with Cubase 4 presets that you'd like to use in another PC application or share with other musicians, the only solution I've found to date is to open up another ASIO-compatible application (I used Reaper), launch the same synth/plug-in, position both the Cubase 4 and Reaper instances to be simultaneously visible on your monitor screen, and copy all the control positions across by eye. With a stunning interface and gorgeous sounds, Vera Kinter's Golden ASET VSTi is a must for anyone interested in using or creating evolving pad sounds. FXP/FXB preset files could also be saved anywhere you chose, but on the PC the new vstpreset files are always saved in one dedicated VST3 presets folder ('C:\Documents and Settings\USERNAME\Application Data\VST3 Presets'). This approach has the advantage that a plug-in can always find its own presets automatically, but I do recommend that you copy the entire contents of this folder regularly to a non-Windows location on another partition/drive, to make sure you have a backup of all your custom presets. In my Internet travels I sometimes discover little software nuggets that others may not come across. This month I'm turning the spotlight on Vera Kinter, aka Artvera (www.artvera-music.com), and for a very good reason: her Golden ASET VST Instrument is one of the most glamorous-looking soft synths I've seen in a long time, and also greatly impresses on the audio front. Described as a "Mythospheric Space Synthesizer", it specialises in pads, textures, soundscapes and atmospherics. Its gold interface, inspired by Ancient Egypt, is beautiful, yet manages to be extremely functional and easy to use rather than merely decorative. 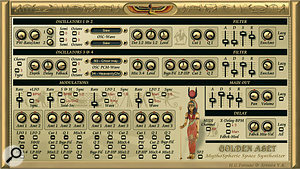 Previously called ASET 2121, the synth was originally released by HG Fortune (whose synths impressed me in PC Notes July 2006), but Vera created both its original graphic interface and many of its patches, and has now taken over its development, adding new waveforms and creating the stunning new Golden ASET interface. 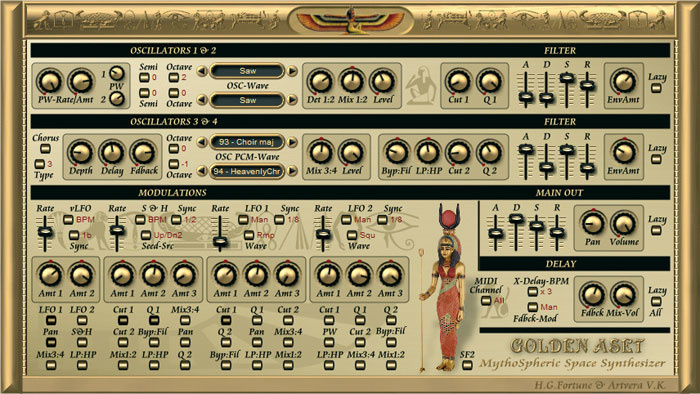 The synth features two 'analogue' oscillators, two digital (SoundFont 2 compatible) ones with 110 waveforms, two filters, three ADSR envelope generators, two LFOs, one vLFO (very low frequency oscillator) and sample and hold (all of which can be BPM-sync'd), plus chorus and digital delay effects. There are also copious modulation routing options, which are one of this synth's secret weapons for creating complex, evolving sounds. There are even four 'lazy' buttons that produce random presets when you're feeling uninspired! I particularly enjoyed the combination of the 'analogue' and digital oscillators. In many patches, the digital samples provide rich, evolving textures while the analogue ones are used to add occasional or rhythmic punctuation, courtesy of the modulation options, or you can create fat, analogue-style sounds and then layer them with a splash of digital icing. It's also refreshing to get such a comprehensive sample and hold module, while the vLFO really extends the options by letting you slowly change the other LFO amounts or Pan settings, for even more complex strangeness and charm. Despite the four oscillators and two filters, CPU overhead is also pretty low. Golden ASET is supplied with a comprehensive and well-written PDF manual. The free demo version periodically generates a noise burst, but is bundled with a generous 256 patches. The full version comes with over 600 patches, plus the ability to load your own SF2-format files into its digital oscillators. As you might expect, there are acres of dramatic deep-space explorations and inspiring fantasies on offer, but Golden ASET is also capable of beautiful, evolving, analogue-like pads, as well as incredibly complex yet subtle animations that remind me of the classic Korg Wavestation. Yet, like all the best synths, it has a unique character of its own. I love it, and it's an absolute steal at just $30! Where plug-ins provide their own preset management, or even their own load/save functions, the VST3 Mediabay makes rather less sense, but if you like its approach and tagging possibilities you'll need to convert your existing presets to the VST3 format. Steinberg provide a dedicated 'Convert Program List To VST Presets' option that will create a bank of VST3 presets from the contents of the currently loaded bank of sounds, but where there are lots of factory banks sorted into different categories this bank-by-bank conversion process can become tedious (Korg's Legacy Wavestation, for instance, provides 18 banks). All the VST3 presets will also end up in one huge scrolling list by default, so if you ever want to search for them by bank you'll also have to create additional bank folders within your main VST3 preset folder. It's also very wise to create separate Factory and Custom folders, so your own creations can be more easily backed up, instead of being lost among the factory offerings. Moreover, you may find with some products that no option appears for converting all preset banks to individual VST3 preset files (in my collection this applies, amongst others, to AAS' Ultra Analog, Lounge Lizard and String Studio, plus Spectrasonics' Atmosphere and Trilogy), and then all you can do is load their presets one by one into each synth and then save them individually in the VST3 format, which is extremely tedious. Luckily for many of us, some of those who have already gone through this careful process have generously made their efforts available to other Cubase 4 users. Jan Lanter of Lanter Audio took up the challenge of converting as many factory banks for different products as he could, and was subsequently helped by various other contributors. Some have been converted using special scripted automation, but many have been painstakingly converted by hand. Jan Lanter now lists this collection on his web site (http://projects.lanteraudio.nl/downloads/cubase). If you want to download some of these files, don't be tempted to copy them into the VST3 Presets folder in the Cubase 4 application folder: this is intended for factory presets only. Instead you need to copy them to your 'C:\Documents and Settings\USERNAME\Application Data\VST3 Presets' folder (if this doesn't already exist, save any plug-in preset from within Cubase 4 and it will be created automatically, which is quicker and easier than doing it by hand). Finally, before you attempt to convert all your preset collections, the new VST3 Mediabay may not be compatible with some multitimbral soft synths, such as Korg's Legacy M1, and it doesn't make a lot of sense for multitimbral software samplers with their own large libraries, such as GVI, Halion and Kontakt, or for 'synth construction kits' such as Reaktor and Tassman, where each synth you load may contain dozens, or even hundreds, of its own presets. Choosing your sounds using Mediabay may be the future, but it remains a hugely frustrating one to many musicians at the moment! Version 5.0 of Spyware Doctor is faster, more thorough, and more deadly to online nasties than ever before. In the PC Notes column of January 2006, I discussed the perils of Internet spyware, adware, trojans, diallers, keyloggers and trackware, and reviewed the Spyware Doctor utility from PC Tools (www.pctools.com). I've used this on a daily basis ever since, on my general-purpose Windows XP partition, and have been well pleased with its performance under fire. It has quietly and efficiently dealt with every spyware attack that's been thrown at my machine, occasionally warned me of known malicious web sites, and generally given me rather more confidence during my Internet travels. Only two aspects of Spyware Doctor previously niggled me. Firstly, with Spyware Doctor 's On Guard protection enabled (for real-time background monitoring), Windows took a significantly longer time to boot up. Secondly, very occasionally (once every couple of weeks) I'd find my PC suddenly sluggish and notice that for some strange reason Spyware Doctor was consuming 50 percent of my CPU (closing down and restarting always cured this anomaly). 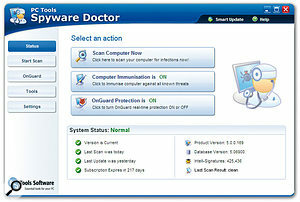 So I'm pleased to report that the recently released Spyware Doctor 5.0 (which now runs under 32-bit Windows Vista, as well as XP and 2000) not only cures both of these problems, but features a fundamental rebuild of its engine, offering a smaller 'footprint', so it loads quicker and consumes less system resources. Its Intelli-Scan is a new and quick 'search and destroy' function that can track down and eliminate actively running spyware threats in just a few minutes, although a Full scan across all your drives, which is even more thorough than in previous versions, is advised at least once a week. New 'Spider' technology uses a combination of known signatures and heuristics (rules of thumb) to help identify threats more quickly, as well as improving detection of morphed and hidden spyware. You can speed up scans by disabling the new options that 'Scan Alternative Data Streams' (a way to hide data in NTFS filing systems) and 'Scan for rootkit hidden files' (sets of programs used to hack into a system and obtain passwords and other personal information), but I wouldn't recommend this. The new SP Protect feature now protects its own files against corruption, while improved Cookie blocking automatically disables malicious tracking cookies, and there's also improved Internet Explorer and Firefox browser protection to prevent loading and installing of malicious plug-ins and changes to start and search pages. 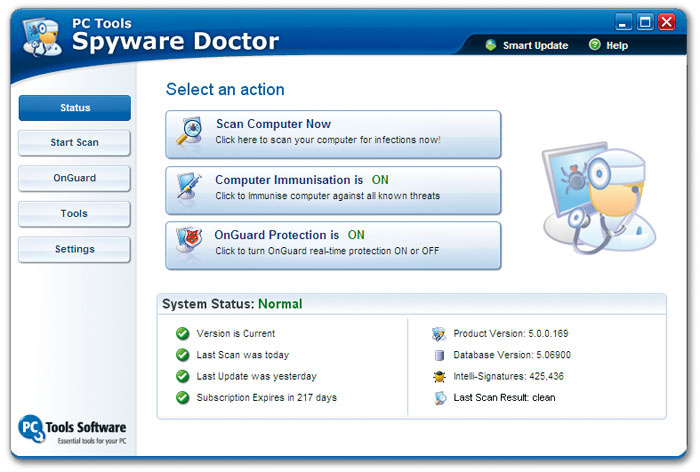 Spyware Doctor 5.0 now lets you scan external drives, including USB sticks, and also has an optional upgrade to integrate the functions of PC Tools Antivirus (the latter is also available as a separate stand-alone product). Combining spyware and virus searches is likely to speed up scan times and reduce the potential for conflicts compared with using two separate utilities. Even though Windows Vista now includes its Defender utility to protect against spyware, Spyware Doctor still seems far more thorough, regularly detecting a significantly larger proportion of threats. Registration is just $29.95 for a single user (quantity discounts are also available), entitling you to unlimited smart updates and customer support for a year.